From time to time, I give a presentation on what I consider to be the most important guideline in software development: Make interfaces easy to use correctly and hard to use incorrectly. Over the years, I've collected a variety of interface examples that either adhere to this rule or, more commonly, violate it, and I try to update the presentation to keep the examples contemporary. I'd like to add some examples from the mobile realm (smart phones, ebook readers, tablets), but--gasp!--I don't have any such devices. Yes, I'm stuck in a technological time warp hovering in the 1990s. But you're not, and I'm hoping you'll be willing to share with me examples of mobile interfaces that are easy to use correctly and hard to use incorrectly...or that aren't. If you could provide screen shots, that'd be ideal. Adhere to the principle of least astonishment. When I talk about interfaces, that includes APIs, so I'd be happy to receives examples of good and bad API designs for mobile platforms, too. 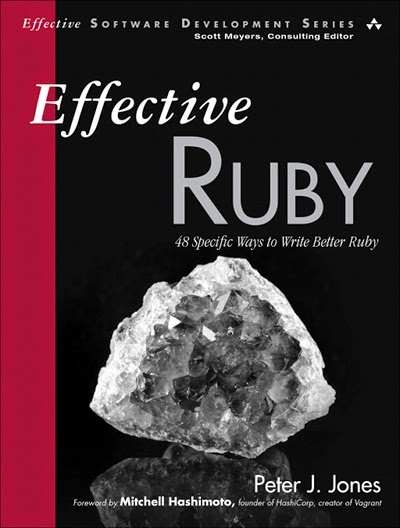 I'm pleased to welcome another book with a full-color interior into my Effective Software Development Series, Peter J. Jones' Effective Ruby. I'm not a Ruby developer, but Peter's writing is a pleasure to read, and his experience with and enthusiasm for the language is clear. For those of you who do code in Ruby, I encourage you to check out this very nice book.